When walking along a river, I frequently meet fly fishermen trying to fish nymphs with leaders that are too short. Keep in mind that this text deals only with fishing weighted flies on a monofilament leader. Unless you are still water fishing, you must realize that your leader will never be hanging down perpendicular from the end of your flyline or your strike indicator. In flowing waters, the drift is always slower near the bottom than it is on the surface. So your pattern will dive at an angle of 30 to 60 degrees (measured against the surface). In cases where a tapered leader is used, getting your pattern near the bottom is even more difficult. An essential prerequisite for successful fishing is a long drift - as long as possible - right near the bottom. Let's imagine a run of 20 meters length and an average depth of 2.5 meters, situated in a part of the river which otherwise averages 1 - 1.5 m in depth. To work this run with a leader of 2.5 to 3 m length (as may be seen very often) doesn't make any sense at all. 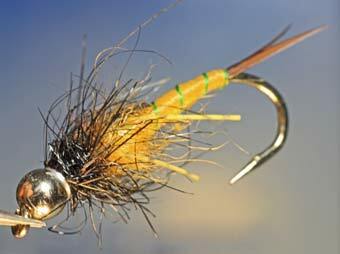 Trying to compensate too short a leader by augmenting the weight of your flies may get you near the bottom, but it will most likely end with you losing your fly. Too bad for the long drift we desire! On the other hand, anglers reporting having lost no nymphs when nymphing all day long always make me smile. If it weren't for the casting practice, those guys might just as well have gone for a swim. What can we do about our problem? A rule of thumb: your leader should be twice as long as the depth of the run you intend to fish. The run mentioned in above paragraph should be attacked with a leader of 5 meters length. This should be monofilament in one diameter (i.e. parallel, not tapered). In case that doesn't lead to occasional snags on the bottom, you still have three more options: - add another meter of leader (and I'm dead serious about that) - fish the same pattern in a slightly heavier version (difficult, unless you tie your own) - if possible, reduce leader diameter! Hard to believe, but the same nymph sinks almost twice as fast on a leader with 14/100 mm diameter than on a leader with 18/100 mm, on a 12/100 mm leader twice as fast than on a 16/100 mm leader etc. Of course, leader strength should be adequate to the size of fish you expect. Leaders that are too weak for the fish force anglers to play the fish too long which may exhaust them so much they can never recover. We don't want this!! On the other hand: if you start having snags all the time from the first cast, you can use the above options the other way around i.e. shorten your leader, fish a lighter nymph or use a stronger leader. The more you fish nymphs in the way we explained above, the better you can judge your options. I see the goal in a good balance of leader length, depth, drift speed, and nymph weight. Now, go out on the river and try to adjust your balance, playing on the parameters of leader length, depth, drift speed, and nymph weight.